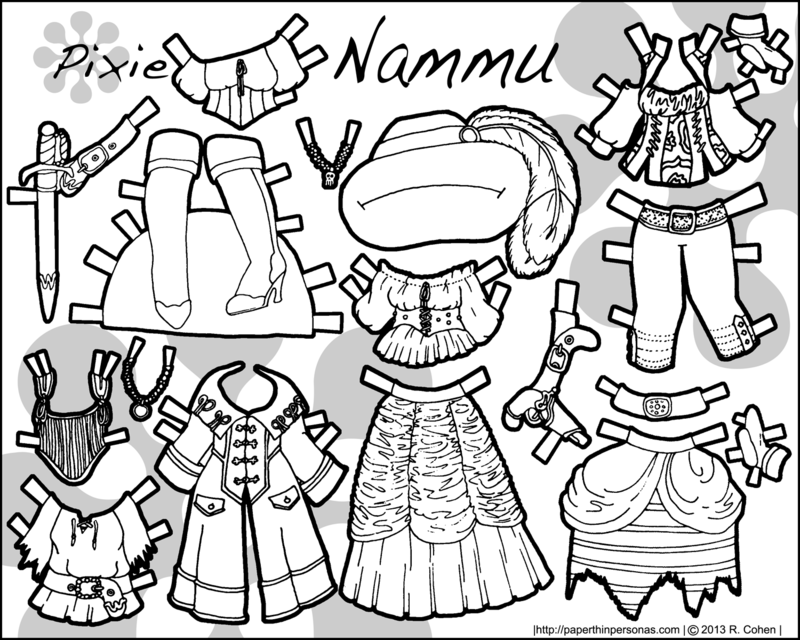 I was asked by a reader to do my Nammu pirate paper doll in black and white. She was posted in full color back in November. So, it only took… um…. six months for me to get my act together. Seriously, it might have taken longer, but I was feeling guilty. Normally, I save the paper dolls in a file with all the layers broken up. The color is on one layer and the line work is on another layer and than the heavy black borders, which I add last, are on a third layer. This time, I saved the file with those layers merged, so I didn’t have a separate line-work layer to work with. Since I didn’t want to redo a lot of work, I tried using Photoshop to remove the color from the paper doll set. I can sat with utter confidence that this worked better than expected, but not as well as I would have liked. I will spare everyone a list of the things that I think didn’t turn out quite right, but the quality of the line work is not what I hoped it would be. Never the less, a black and white Nammu is better than no black and white Nammu, so hope whoever asked for it (and I honestly can’t remember who that was) is pleased with the outcome. And besides, once you color her, I don’t think my insecurities about the line work will be obvious. Some people have expressed fear that the Mini-Maidens will replace Pixie and Puck in my heart and I hope that this Pixie paper doll reassures people that I still love the Pixie and Puck paper dolls. will you be posting another flock fairytale doll any time soon. I can’t wait to see what you will do for the red riding doll you mentioned i also hope ou will be doing a beauty and the beast flock fairytale some time in the distant future.Would it also be possiable for you to make a blonde flock doll i love all your flock dolls but a blonsish doll would be cool becasue i have blonde hair! also where do you get the magnets for making the magnetic paperdolls and do adhesive or printable work better? Any ways i love your flock fairytales i can’t wait to see more from thsi series collection… have you ever seen the T.V. show once upon a time you could get some fashion- ideas for fantsy outfits from the show. My other favorite doll is marisol monday i love all teh cute things that you have done with her she is so fashion forward!I also am excited to see what you will do with your new collention minni madens i think they are super cute and i would love to see a few of them in color. Your paperdolls are some of my favorites i have evver seen! they are all super awsome and ceative! Yes, there will be another Flock Fairytale doll soon- Little Red Riding-hood is nearly finished. I have full directions for making magnetic paper dolls here : http://paperthinpersonas.com/printable-paper-doll-index-2/magnetic-paper-dolls/ which should give you everything you need to know about making Magnetic Paper Dolls. Both printable magnetic-sheets and adhesive ones work well, it’s a matter of what sort of printer you have and how much flexibility you want in selecting what clothing to make magnetic. I haven’t yet decided if I will do any of the Mini Maidens in full color. It’s not the plan at the moment, but that might change in the future. I’m so glad you like the paper dolls. Thank you so much for this new paper doll! I am really looking forward to coloring it, but when I clicked on the first page, the one with the doll on it, it says that the page isn’t found. Is there anything that I could do to help it be found? You can tell me and I can check my code and find a typo and fix the typo and now it should be fine. 🙂 Sometimes I confess that I don’t check my code as closely as I should.